The Seattle music scene is home to not only the infamous origins of grunge or the latest up-and-coming hip hop, but also to a recently revitalized, world-class jazz community with roots in Prohibition-era nightclubs. Bumbershoot is proud to highlight Seattle’s love of jazz music with a programming block on Saturday, August 31 at the Starbucks Stage. This section of the lineup will highlight three groups of local performers in celebration of the 15th Anniversary of Seattle jazz label Origin Records, as well as the Brooklyn-based, Grammy-winning Robert Glasper Experiment. At the other end of the spectrum is Grammy-winning sax player Ernie Watts. A jazz veteran, Watts has appeared on over 500 recordings and played with artists ranging from Frank Zappa to Marvin Gaye. He has been playing professionally since the age of 16 and studied at Berklee College of Music in Boston. In celebration of Origin Records, Watts will be joined at Bumbershoot by New Stories, a Seattle-based, Grammy-nominated jazz trio that features Origin founder John Bishop on drums. The musicians have collaborated in the past–including on a full-length album–and their Bumbershoot performance is a must-see. Looking to catch some of the biggest names in local and national jazz? Don’t miss this music focus on Saturday, August 31, and be sure to add the artists from this feature to your Bumbershoot schedule. 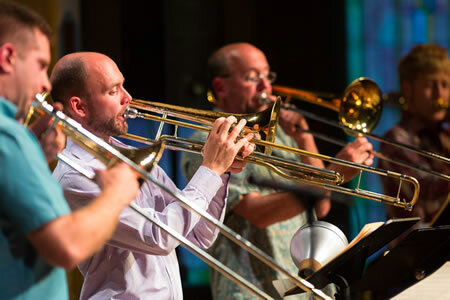 The Centrum All-Star Big Band directed by Clarence Acox played a Salute to Quincy Jones at Jazz Port Townsend last July, and Jazz Northwest was there to record the concert. The full-length concert broadcast will air on Sunday, September 1 at 2 pm (PDT) as part of a series of live concert recordings from this year’s festival. Quincy Jones grew up in Seattle and attended Garfield High School. He got his first big band experience in Seattle, and it’s fitting that this Salute to Quincy Jones is directed by Clarence Acox, who has directed the multi-awarding winning jazz band program at Garfield High School for 35 years. 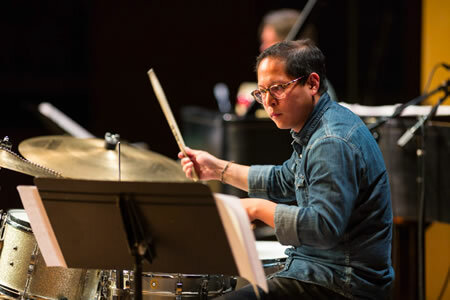 He is also a professional drummer and co-director of the Seattle Repertory Jazz Orchestra with Michael Brockman. Many musicians in this concert have played in both bands. Selections by Quincy Jones include the Theme from Golden Boy, Stockholm Sweetnin’, The Midnight Sun Will Never Set, Quintessence and others. 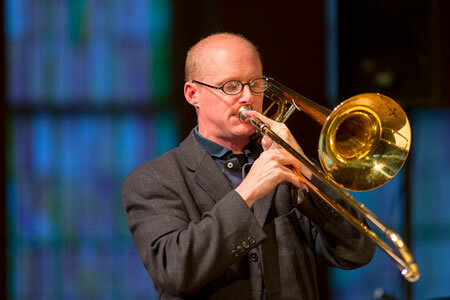 Jazz Northwest is recorded and produced by Jim Wilke, exclusively for 88.5 KPLU. The program is also available as a podcast at kplu.org following the broadcast. Next concert in the series will feature René Marie and Sachal Vasandani on September 15. Fall is almost upon us, School is almost back in session … so there are only a few more outside concerts to check out before the weather turns. If you are headed to Bumbershoot this weekend, Saturday will host a few jazz shows including a 15 Year Celebration of Origin Records on the Mural Ampitheater Stage featuring Matt Jorgensen +451 (12:00pm), Human Spirit (12:30pm) and Ernie Watts with New Stories (1:10pm). The Ernie Watts show will be special on a couple of points. Their CD, Speakin’ Out, remains the top all-time seller for Origin Records and the show will be a reunion of sorts for New Stories (Marc Seales, Doug Miller and John Bishop) who haven’t performed together since Miller moved to the Bay Area. Performing after the Origin Records Showcase will be the Robert Glasper Experiment at 2:45pm and later that night saxophonist Maceo Parker closes the evening. Both shows are also at the Mural Ampitheater. This year’s Pony Boy Jazz Picnic is less “concert” and more “jazz community company picnic”. Billed as “Un-plugged, un-scheduled and un-staged”, the event is being scaled back to it’s original intentions – a gathering of friends and musicians in the park. The event is free, people are encouraged to bring a dish to share, and to come and socialize and play some music. The picnic runs from 1-4pm and is located at Magnuson Park on 74th and Sand Point Way NE. Seven-time Grammy Award winner Al Jarreau will be performing with the Tacoma Symphony at the Washington State Fair (or as most of us know it, the Pullayup Fair) on Tuesday, September 10th. Tickets start at $20, so if you are planning on making at trip to The Fair, why not catch a concert and get free admission! This week on Jazz Northwest we’ll remember some of the influence the late Cedar Walton had on Seattle musicians. He played Seattle jazz clubs like Parnell’s and Jazz Alley, did workshops at Cornish College and arranged and played on Jay Thomas’ first album. 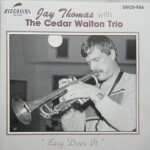 We’ll hear a young Jay Thomas playing with the seasoned Cedar Walton Trio in 1984, and Cedar Walton’s tune “Bolivia” played in concert by Chris Amemiya & Jazz Coalescence issued this year. 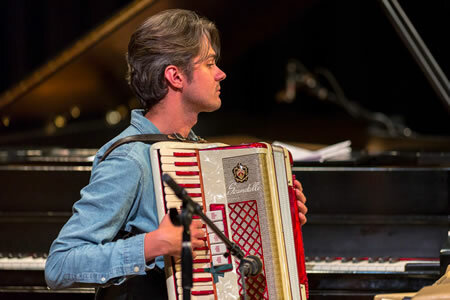 New music from Vancouver and Portland too on this week’s show, plus Latin jazz with Lary Barrileau, and Cuong Vu 4-tet on Jazz Northwest, Sunday at 2 on 88.5, KPLU. 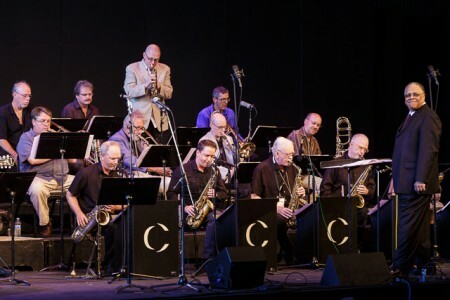 Next week (9/1), the Centrum All Star Big Band plays music by former Seattle resident Quincy Jones, conducted by Clarence Acox at Jazz Port Townsend. Truly an all -star band, it includes top soloists from around the US including the Pacific NW. 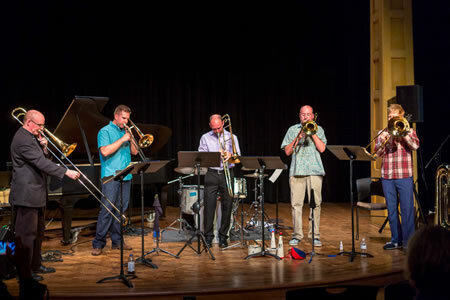 Hard-hitting trumpeter Jim Rotondi, who for many years lived in New York but is now teaching in Graz, Austria, returns for a Northwest string of shows including tonight and tomorrow at Tula’s Jazz Club. Click here to listen to Rotondi’s recent CD for a preview of the show. 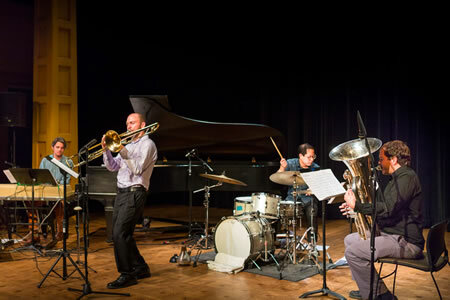 Trombonist Christian Pincock performed music from his new album release Plentiful Excitement, as well as new works to be released in the future, with Aaron Otheim (piano), Jon Hansen (tuba) and Chris Icasiano (drums) last week at the Chapel Performance Space. Wonderful music. Seattle Jazz Scene has a couple of great concerts coming up which will first announce to our Mailing List before tickets go on sale to the general public. Make sure and sign up for the Seattle Jazz Scene emails (the box in the right-navigation column) and you’ll be included (we’ll be sending out the first announcement on Tuesday morning). David Marriott and his jazz trombone quartet Slushpumpers Union performed at the Chapel Performance Space opening for Christian Pincock’s Group. 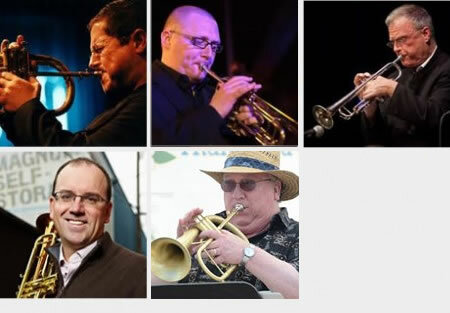 Seattle Jazz Scene is proud to present Two Nights of Trumpets in Seattle. 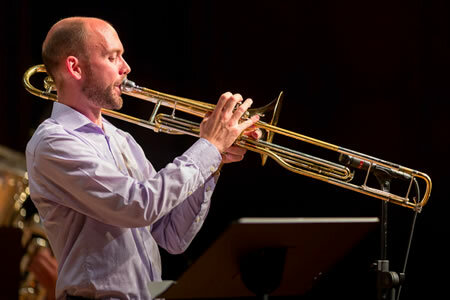 Trumpeter Jim Rotondi will be passing through Seattle on a west coast jaunt. Joining him will be piano phenom George Colligan, bassist Jon Hamar and drummer Matt Jorgensen. Make sure and make your reservations now for these two great nights of music. 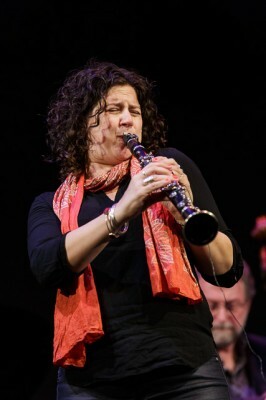 Anat Cohen has been winning both critics and readers national jazz polls for several years and she tours continually, playing major jazz festivals and clubs around the world. The last week of July found her in Port Townsend, WA where she was teaching and performing at Centrum’s annual jazz workshop and Jazz Port Townsend Festival at Fort Worden State Park. Her performance with Dawn Clement, piano, Chuck Deardorf, bass and Jeff Hamilton, drums was recorded for Jazz Northwest and will air on Sunday, August 18 at 2 PM (PDT) on 88.5 KPLU and simultaneously stream at kplu.org. Anat Cohen was born in Tel Aviv and received her early musical education and experience playing jazz there. While attending Berklee College of Music in Boston she encountered students from Latin and South American cultures which she absorbed into her own music. That experience was further enhanced by a move to New York after graduation which expanded her musical horizons in a variety of settings. She started her own record label, Anzic Records and has recorded seven CDs as a leader, the most recent is titled Claroscuro. She also plays soprano and tenor saxophones with authority, but her clarinet playing has drawn the most favorable attention and she choose to concentrate on clarinet in this concert. Included are the Artie Shaw theme song Nightmare, Fats Waller’s Jitterbug Waltz, Jimmy Rowles’ ballad,The Peacocks and a Brazilian choro by Pixinguinha, Um a Zero.